Efficient thickener is applicable for concentrate and tailings dewatering in mineral-selecting company. It increases 20-30% of pulp to 40-70%. So it is widely used in industries such as metallurgy, chemical, coal, non-metallic mineral processing and environmental protection. 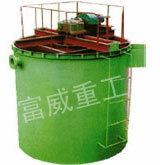 Efficient Thickener is actually not a simple device for settlement, but a new type of filter dewatering equipment, combining with the mud layer. (4).Equipped with a complete self-control facilities.